In watching my Grandpa’s private life philosophies, I think about how I would react if I won the lottery. I wonder, “Would I take the winnings anonymously“? Would I let the sudden expansion of wealth affect my lifestyle? If I were to win the lottery tomorrow, here are my top 5 things I would do if I won. Payoff all my debts – I’d be sure to practice what I preach and pay off all my debts. 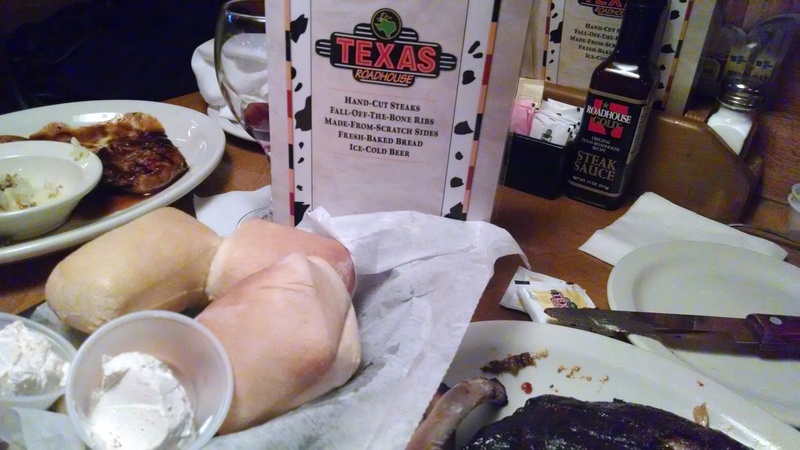 Hire a chef to make me Texas Roadhouse Rolls and Cinnamon Butter everyday – I know this is a bit of an oddity, but if I have enough money I think I’m allowed to splurge for at least one treat. Gosh I love these things! Meet with an accountant/financial coach prior to taking my winnings – in dealing with any large influx of money it just makes sense to have a plan. A plan of both how you’ll spend your money and how you can protect your wealth long term. On top of that, it would equally benefit you (in terms of taxes) to decide how you are going to tithe or donate money towards a cause you are passionate about. Live within a budget – often times lottery winners will “live it up” and spend as though they are not bound by money. However, are you aware that 70% of lottery winners are bankrupt within five year? It makes sense to continue to live within a budget or you may find yourself like one of the 70%! Honestly, I very rarely play the lottery, but when I do I often find my imagination getting the best of me. As I drive home I’ll often think about what I would buy first or how I’d quit my job (maybe) or what type of vacations I might go on with my family. Even though the odds are completely against you or I ever winning the lottery it’s smart to have a similar plan on how you’ll spend an inheritance or any large sum of money. The odds are more likely that you’ll obtain an inheritance before ever winning the lottery. I’d like to hear from our readers on what you’d do if you won the lottery or how you’d spend a large inheritance. I would see a tax attorney to set up a trust. I’d see a good financial advisor. I’d give some to charity. I would retire. I would meet with an architect to design my dream home. It would not be a huge house. I’d spend March through mid-April in Crested Butte Colorado. It would let me escape all this allergy crud. I would do some traveling in the USA, Canada, and the UK. Maybe, I’d go to Germany, Belgium, Holland, and Italy. Same dreams as everyone: payoff debt, pay into retirement, pay for college for dependents, take more vacations, spend more time with family & friends. I would still keep my job, perhaps part-time though. I would hopefully still keep my car until it completely dies. Then get a modest replacement. Open a bakery- that sells alcoholic baked goods… Rum filled cupcakes anyone? My husband would like to open a game store, not video games, but board games. Both my daughter and I would like to get our pilot’s licenses. 1. Give enough money to our church for them to add a new wing and name it after a certain pastor who had an awesome impact on our family’s life. 2. Star on my own T.V. show. 3. Buy my wife a corvette that had a custom car seat for our daughter. I would buy 100 acres build a small home and plant all the berry bushes and fruit trees to supply my family. Build a large root cellar and a greenhouse. Good info. My question is, how long do you have to live in these states to be legal? We really enjoy you guys. Thanks! What a crazy stat “70% of lottery winners are bankrupt in one year”! If I won the lottery I would take my winnings annonymously, pay off my student debt, buy a home in VT, splurge a bit on a new wardrobe/fixings for the home then try to live modestly off the winnings and my work… maybe a vacation. I’ll never actually win the lottery because I don’t play the lottery but if I ever stumbled upon a large sum of mula I hope I wouldn’t allow it to change my lifestyle… just allow me to accomplish some of my financial goals sooner. After taking care of myself and my family, I would give the rest to cancer research. It’s taking far too many lives — and too early. Mike – you can’t go wrong their! I agree that cancer has taken way too many lives. Interesting those states are the only ones that allow you to take winnings privately. Thought you could do that anywhere? I have a ticket for the Ontario Lotto Max draw this Friday night. The grand prize is $50 million but there are also 50 prizes of $1 million up for grabs. I would be happy with just the $1 million because $50 million could really mess up your life and make those around you crazy. I like working and I love my job but I might like it more if I was there because I wanted to be there instead of because I have to be there. I would hire a maid. I hate cleaning my house. If I won the lottery, I’m going to make a plan first and identify my needs. Too boring, right? Well, it just happened that I have published an article about how one can handle windfalls properly a couple of hours ago, and maybe it can also help your readers. Here’s the link to it: What To Do With A Windfall? Mark – that makes complete logical sense. I think the problem most lottery winners have is that they don’t have a plan. They just know they are going to spend it. I always thought that I’d pay off the mortgage and all debt, but I’ve already done that. So, after taxes, I’d stash the money in our investment accounts and buy a 2nd home in Alaska. Kathy – not a bad plan! I hear Alaska is beautiful. Laurie – why would worry about your parents first?